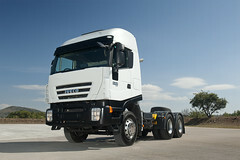 New daily chassis cab is unbeatable when used in yards as well as agile and fast in city transfers. Proposed configuration axle rear axle in single or twin wheels, is craft designed and built to work hard. It is the ideal solution for installations, boxed fixed, tilting, vans, isothermal alloy and special applications such as garbage collection. In this regard, Streets & Transport Iveco co-created with a special edition called "+ Daily," which highlights some of the major equipment achievable with Daily chassis cab. Browse it by clicking here. Also watch the video "Out of Test" dedicated to the versatility of the new Daily chassis cab on our YouTube channel.